Fernando Sací's musical career began at the young age of seven when he learned to play the steel pan and tambourine at a small community center in Campinas, Brazil called Casa de Cultura Tainã. With a natural talent for all things percussion, he quickly mastered his craft and soon began teaching various percussive instruments for others at the center. After playing professionally for several years, in 2002, Sací was selected to study at one of the most respected musical conservatories in Brasil, Conservatório Dramático e Musical "Carlos de Campos" in Tatuí, São Paulo. 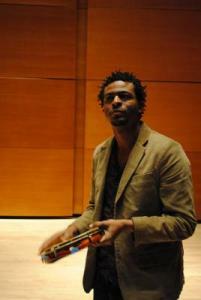 At Tatuí, he specialized in jazz and MPB percussion and graduated in 2005 to explore many other genres of music. Over the past 20 years, Sací has participated in innumerable shows and recordings and has shared the stage with the likes of Gilberto Gil, Dona Ivone Lara, Leci Brandão, Almir Guineto, Monarco da Portela, Proveta, Bule-Bule, Wandê, Maracatú de Porto Rico, Fernando Baeta, Marcelo Modesto, Estrela Brilhante, Leão Coroado and Chico Gomes. Local bands he has started, directed or participated in include (but are not limited to) Sacicrioulo (Afrofunk), Black Dog Funk (funk), Projeto Semente (jazz fusion), Los Guajiros (salsa), Havana Club (salsa), Villa Baggage (Brazilian country), Tambores de Ouro (folkloric samba), Gafieira Camisa Amarela (samba/gafiera), Sandália de Prata (samba rock) and Tambores de Aço - Casa de Cultura Tainã(steel pan). Saci composes, produces, directs, arranges and records for various artists and has created and delivered dynamic workshops at community programs targeting "at risk" youth in various cities including Campinas, São Paulo, Chicago and New York. Dirigiu musicalmente e produziu shows e espetaculos musicais em diversas partes do pais. Teve um trabalho singular nos Estados Unidos, com workshop de mistura ritmica com crianças de escolas segundarias, levando a percussão brasileira a Chicago e New York, de uma forma de socielizaçao entre os povos.